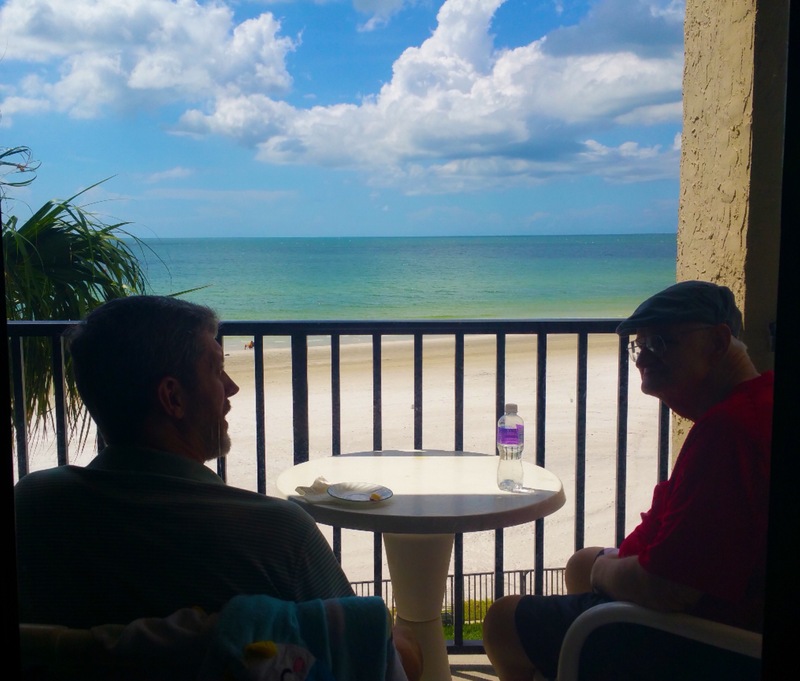 I took this photo last month when we spent a couple of weeks visiting the kids down on Florida’s gulf coast; we brought Bill’s parents down with us this time. I couldn’t tell you which day this was, mainly because at some point every day Bill & Dad were sitting in conversation. I don’t think I know of any two people on this planet who enjoy conversing more than these two. In this pic, they’re out on the balcony. They usually start in the main area with everyone else – the T.V.is on, there are lots of voices, dishes are clattering – but at some point they’ll get up and go into another room; just the two of them. It’s too hard to listen to just the one voice with all the other voices, noises, and activity. If and when I want to get Bill’s attention when he is with his dad, I don’t usually get a response from him on my first call, it’s at least two (sometimes more); “Honey” “Honey” “Bill” before his head pivots around to respond. In those times he’s listening for only one voice, his dad’s. Advent is my balcony. A space separated from the normal clatter and chatter of everyday life. A place for me to listen, really listen, for His voice.